Dunbar Library is now offering private study rooms available to individuals and groups. Users can reserve the rooms in two-hour time blocks during the library’s regular hours. Wright State University students and employees have more spaces where they can quietly study and work in Dunbar Library. The library has expanded from four to 13 the number of private study rooms available to individuals and groups. Users can reserve the rooms in two-hour time blocks during Dunbar Library’s regular hours. The new spaces are another way the library continues to serve students as well as faculty and staff, said Sue Polanka, the university librarian. The library now has seven quiet individual study rooms on the third floor. Each room has a door, Window computer with dual-screen monitors and access to a networked printer. The individual rooms provide a quiet space for users to work, write papers and do research. “Users can book the rooms in advance and know that the space is reserved for them. The rooms offer a quiet space and privacy to be able to focus on their project,” Polanka said. Four group study rooms are now available on the second and third floors. Two of the rooms are equipped with video projectors and all of the rooms have whiteboards. One room features the setup typical in an electronic classroom to help students practice presentations. The group study rooms also give users privacy without disturbing others. “They can have some privacy to have their meetings and do their projects,” Polanka said. The library also offers two rooms in the STAC, or the Student Technology Assistance Center, outfitted with audio and video recording and multimedia editing equipment. The studios provide special software not found on other library computers, including Camtasia, Audacity, Final Cut and Premier Pro. Current Wright State students and employees can reserve the private study and group rooms and STAC studios. Reservations can be made online, by calling the Information Desk at 937-775-2925 or by stopping at the Information Desk on the second floor of Dunbar Library. The library also converted an area on the second floor into a large quiet study area for students. Over the summer, the library will fill the space with new furniture designed for single-person use. The new individual study rooms rooms provide a quiet space for users to work, write papers and do research. The changes and upgraded space are influenced by a building-use survey of students the library conducted in 2015. In the study, students said they wanted more space to work in groups and study quietly. “Primarily they said, ‘we need more quiet study areas and we need more private spaces for individuals and groups to meet,'” Polanka said. Students also asked for computers in designated quiet areas and printing stations throughout the library. 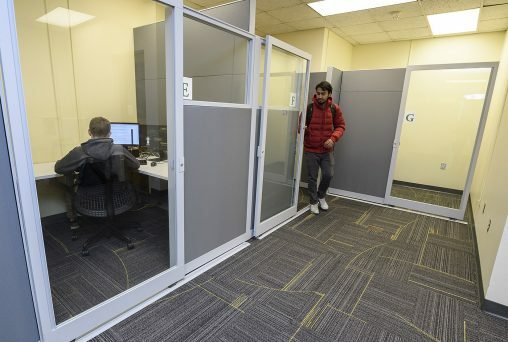 “What the results of the study told us was students were all coming here for many, many different purposes and they needed different types of spaces,” Polanka said. The library will raffle off one of the private study rooms for a student to use exclusively from April 21 to April 27, before finals week. Follow the Dunbar Library Twitter account for more details. 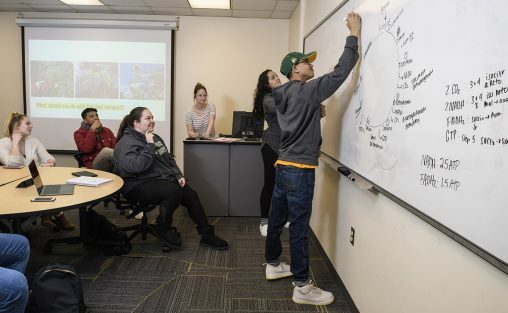 Wright State received $1.1 million in capital funding from the State of Ohio to renovate and increase study spaces, replace furniture and replace the carpet in Dunbar Library. Over the winter break, the library installed new carpet on the second through fourth floors and rubber flooring in stairwells. 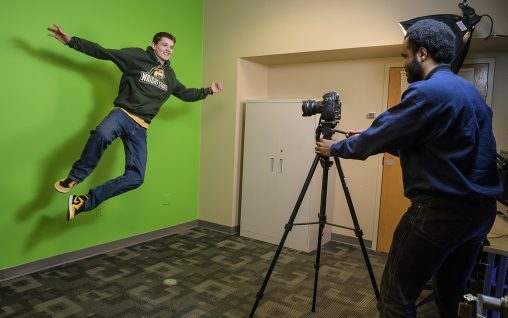 The STAC, or the Student Technology Assistance Center, provides students with access to studios with audio and video recording and multimedia editing equipment. The next portion of the project takes place in May, when the library will install new furniture, including soft chairs, lounge furniture, tables, booths, group stations and study carrels on the second through fourth floors. The majority of the new tables will have electrical outlets, and the library will have special power towers spread around the building to help students keep their devices charged. Learn more about the new private study rooms on the Dunbar Wire blog.